This Giveaway is open to everyone who leaves a comment on Lilly's Life posts from 29 June 2009 through to 5 July 2009. Entries close midnight 6/7/09. 1. 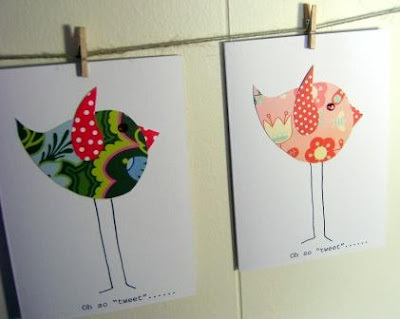 A set of gorgeous Oh so Tweet cards from Sarah Emily Design . These are the cutest ever. I have a set myself. The 6 cards are made on heavy linen cardstock. There are two different designs... three of each. Hand cut and drawn by moi! Sarah, who is based in Adelaide, Australia has some great craft products at her Etsy shop. Black Eyed Suzie has given a gorgeous print as part of this month's giveaway. You can choose from one of these doll prints. Aren't they adorable. Black Eyed Suzie dolls are inspired by Victoriana, Edward Gorey, Tim Burton, and many, many talented doll artists. See Black Eyed Suzie's Etsy shop here. And the Black Eyed Suzie blog here. TheToronto based Joo Joo etsy shop has especially made an owl magnet for the Lilly's Life giveaway. Joo Joo has some fabulous one of a kind and colorful mini sculptues, jewelry, magnets, prints and more. Do you have a little girl in your life? I am sure she would love some hair accessories. The winner gets to choose which one you would like from Little Itty Bitty's great range. Each itty bitty piece is artistically designed and totally crafted by hand. Each piece is unique, quirky and created with a tremendous amount of time, care and love! Designed & crafted totally by hand! 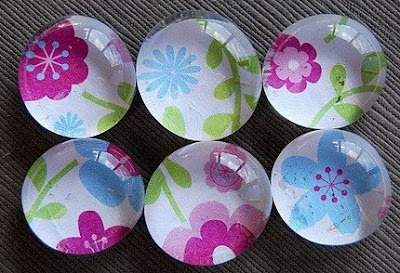 Spice up your kitchen or office with these glass marble magnets, featuring fun, funky flowers in pink, blue, and green on a white background. Includes 6 glass pebble magnets sealed with Diamond Glaze. Attached to super strong Rare Earth metal neodymium magnetic disc. Approximately dime-sized magnets (image to show size, not design). Packaged in a cute metal tin for gift-giving or storage. See Daisy Mae Designs Etsy shop for more great craft ideas. To enter giveaway, make a comment on any post from 29/6/2009 to 6/7/2009.